State Media: North Korean Leader Visits China - Integration Through Media ....! 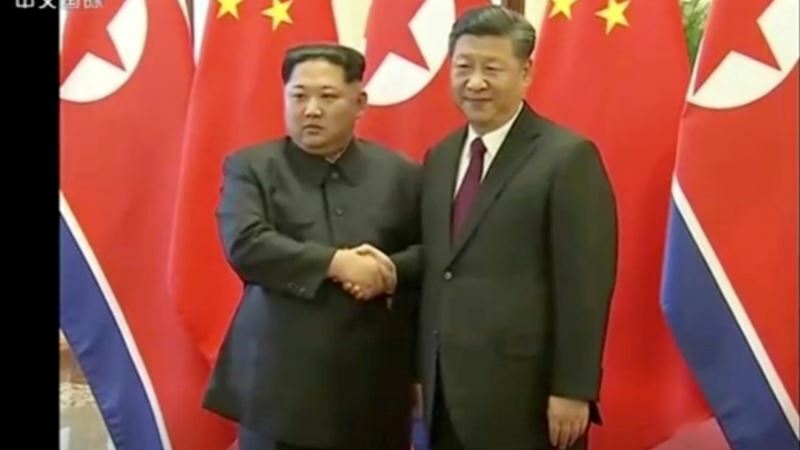 (VOA): North Korean leader Kim Jong Un visited China this week on an unofficial visit, China's state news agency Xinhua reported on Wednesday. It was the reclusive leader's first foreign trip since taking power in 2011. News media had reported that a train believed to be carrying the North Korean delegation departed Beijing amid tight security in the city. But it was not clear who was aboard. Speculation about the identity of the North Korean visitor began building Monday after video footage from Japanese TV caught images of an older green train arriving in Beijing. Japan’s NTV network said the green and yellow train was very similar to the one that former North Korean leader Kim Jong Il, Kim Jong Un's late father, took to Beijing in 2011. The elder Kim was the only other North Korean official to ever use a private train to visit leaders in Beijing. “Except for Kim Jong Il, North Korean high-level officials have never visited China by using the special train that Kim Jong Il used in the past,” said Cheong Seong-chang, a North Korea analyst with the Sejong Institute in South Korea, in an email message to media contacts in South Korea. Neither North Korea nor China has confirmed any details about the reported visit. If the media reports turn out to be true, a visit by the North Korean leader — his first outside the reclusive country since coming to power in 2011 — or his sister, who has played an increasingly crucial role as a key diplomatic envoy from the North, would have broad diplomatic significance. Analysts say the visit may be part of a broader shift by the North to pivot from a confrontational stance to diplomatic outreach. After a November missile launch, Pyongyang suspended further provocative tests after declaring it had achieved the capability to target the United States with a nuclear-armed intercontinental ballistic missile, though independent analysts say further tests are required before it reaches an operations stage. The Trump administration responded with a “maximum pressure” campaign to force North Korea to give up its nuclear arsenal, using economic sanctions and the threat of military force. Since then, the Kim government has gone on a “charm offensive” by participating in the recent winter Olympics in the South and by sending Kim's sister to lead a North Korean delegation to the games, and by agreeing to engage in nuclear talks with Washington and Seoul. “If he [Kim] is really here, I think it means that, given the complex international situation, he needs to do something to strike a balance for the peninsula's strategic development. He is here to play a balanced role,” said Cai Jian, a North Korea specialist at Fudan University. Cai added that such a visit would also bode well for Kim to shore up its rocky relationship with China and ease international concerns as he prepares for talks with world leaders, including a potential meeting in May with U.S. President Donald Trump, an inter-Korean summit with South Korea's President Moon Jae-In in April and a possible meeting with Japan's prime minister. Bonnie Glaser, senior adviser for Asia and the director of the China Power Project at CSIS, the Center for Strategic and International Studies in Washington, told VOA that Beijing probably initiated the meeting with either Kim or another high-ranking North Korean leader. China has long been one of North Korea's most important allies and its biggest trading partner, but relations have been strained by Pyongyang's nuclear and missile tests as well as Beijing's support of sanctions. A visit by Kim could further prove beneficial to both sides, alleviating Beijing's concerns that it might get sidelined as the United States and North Korea look to meet. “There has rarely been talks between Kim Jong Un regime and Xi administration [leadership in Beijing], and as it is at a state where mutual distrust is very strong, there are concerns about the outcome where Kim Jong Un regime will make a deal with the U.S. for the survival of its national regime, and might revolt against China,” said Seo Jeong-kyung, professor at the Sungkyun Institute of China studies in Seoul. A Kim visit to Beijing would have historic significance. Since taking office in late 2011, the North Korean leader has not left his country, nor has he met with any other foreign leader. His father, Kim Jong Il, often visited his country's most important ally China, and in 2000 met then-president Jiang Zemin before a summit between the two Koreas. Joyce Huang and Ira Melman contributed to this report.